This Question and Answer blog relies on your questions! Please feel free to submit a question on math content, pedagogy, curricula, and the like here by emailing Allison at qanda @ msmi-mn.org (remove the spaces, please.) We will endeavor to answer in a timely fashion. We accept standards in sports...how about in quality math instruction? I have heard many parents and teachers echo the sentiment that standards, and using standards to choose a curriculum, is too restrictive. I've yet to meet a single person who felt that having standards for levels in sports was "restrictive" for coaches. I've never even heard of a coach who felt that standards for player skills was a negative, either. Sure, some may quibble about which skill when, but never that someone should not prescribe a list of skills students need to have. Generally, people agree that youth sports should teach fundamentals well in ages 8 - 13. Whether or not that child will play sports competitively in high school or beyond, competency in mastering these skills is a requirement for even the opportunity to play at the high school level. They agree as well that certain skills come first as building blocks for other skills. Parents seek out and join youth sports organizations with quality instruction programs and quality coaches. Nearly every one of those has a set of standards for their levels. Those standards are what the coaches are expected to know, and expected to instruct students so they master those standards before moving on. Parents don't typically *know* the list of skills being taught, or in what order, but they know what the results are. Let's take skating as an example. There are two major skating orgs in the US, and nearly every rink here has a learn to skate program that corresponds to one or the other. At every International Skating Institute (ISI) skate school in the world, they have a beginning alpha-delta system, and then more for competitive programs, like freestyle or pairs or speed skating. To progress to the beta, you must complete alpha. It doesn't matter how many times you've been to class, or your age, that's the standard for moving up a level. The teachers know to teach that--how, up to them, but those skills before progressing. You can't earn a delta badge without shooting the duck. Why do they bother with such rigid standards? Because e.g. you will not be able to do the freestyle one half flip if you can't do a one-foot turn (delta level). Math is not different in this way. To suceed at the abstraction of algebra, you need to be able to handle fractions. To handle fractions, you need to have mastered whole number arithmetic. US Figure Skating Assoc. has a different list, levels 1-10, and some skills come at different times, emphasized in different ways. But again, a set of standards--this is what they teach at level 4 to go to 5, etc. Their coaches are expected to teach these levels, in this order. They don't get to call themselves certified coaches if they deviate. They still have the freedom to figure how to teach these skills, and they make changes in their methods depending on their students. But their students need to be able to do a regimented set of skills to progress. A parent can get a kid up on skates and around a rink, but unless that parent knows every supporting skill, and how to break them down, they aren't likely to get their child proper enough technique to support that one half flip. Likewise, a homeschooling parent or a generalist teacher needs to know the supporting skills in math, and how to break them down to ensure proper mathematical technique. Let's look at youth hockey. USA Hockey is the sponsor of nearly every youth hockey program in the country. Their programs have coaches that must follow a prescribed curriculum (now called the American Development Model, ADM) with handbooks, DVDs and trainings. Inside that curriculum, which describes how every practice should be run, down to how many minutes per week and weeks the program should be, they also have standard for skills at every level. They also have standards in Knowledge, Goal Setting, Team Play, Nutrition, Fitness and Training, Injury Prevention, Sports Psychology, Character Development and Life Skills. And yes, they push up by age, even if not every skill is met because some skills will come with different physical and mental development. But kids who don't develop and complete this mastery on this track won't make it to Bantams. By then, it all had to come together. Martial arts, anyone? The belt system is a standards system. I'm sure there are proverbs explaining how the restrictions lead to freedom in each martial art. I could find you lists of standards for youth skill development in tennis, golf, soccer, swimming, and more. Keeping the doors open to the possibility of playing these sports after 13 requires a specific set of fundamentals must have been mastered, year over year. Being able to succeed in high school math requires training just as sports in 8th grade and beyond do. If you don't have the fundamentals down by 8th grade, you will never catch up. But math is harder as a subject, since it is so linear. Skip something, and you will not understand, and at some point, the struggle to stay afloat will be too much. the standards, and they don't make excuses that the standards are restrictive. 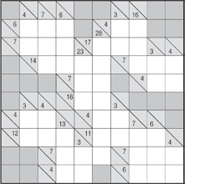 Just about everyone has now seen Sudoku, but there are another dozen similar and fun puzzles that teach even more math skills. You can find many free versions of these puzzles on the web at http://www.mathinenglish.com/index.php or other sites on the web. Ken-Ken is terrific! There are even books of KenKen puzzles in the US that you can purchase. 1. Use each number only once per row, once per column. 2. Cages with just one square should be filled in with the target number in the top corner. 3. A number can be repeated within a cage as long as it is not in the same row or column. That's it! Can you solve the sample above? Each grid has horizontal and vertical lines containing either clues or empty cells. The clue number is the sum of the empty cells it represents. These clues are printed either above a diagonal line or below a diagonal line. If the clue is printed above the line, the clues is the sum of the empty cells to the right. When the clue is printed below the line, it is meant for the row of empty cells below the clue number. Each number between 1 and 9 can only be filled in once! So when the clue says 4, and there are 2 empty cells, you cannot fill in 2 and 2. The answer must automatically be 1 and 3. What is Shikaku or Rectangles ? Sikaku is all about the areas of squares and rectangles. The player has to fill a grid with rectangles or squares with areas of already printed numbers. When an 'eight' is printed in the puzzle the player has to figure out whether to draw a '8 by 1' rectangle or a '2 by 4' rectangle. When a 'nine' is given, a '3 by 3' or '9 by 1' rectangle/square must be filled in. The areas of prime numbers are easier! A 'thirteen' printed in the grid can only mean a rectangle of '13 by 1'! The more clues in the puzzle, the easier it is to solve. The difficult Rectangle puzzles contain no clues at all! Use your logic skills to do the math! Fubuki is and great math game, or number puzzle, in which your addition and multiplication skills are needed. 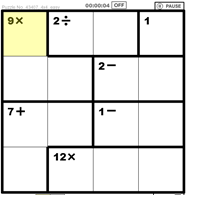 Each puzzle consists of a 3 by 3 grid which has to be filled with the numbers 1 to 9. Each number can and must be used only once and, in case of the addition Fubuki, add up to the totals of each horizontal or vertical row or column of 3 numbers. In the case of the multiplication Fubuki, the 3 numbers are the multiples of the given products. The rules of this maths game are pretty simple, but solving these puzzles is another story. Brain training to the max! Summer is a time for fun, not necessarily a bunch of math worksheets. But you can increase mental math skills and practice number sense by playing games. Board Games: Board games can teach number sense, addition, and virtues such as patience and stamina. For children in preschool through primary grades, playing games where they practice moving the correct number of steps is good practice for the number line. Emphasize that a move of 3 means counting 3 hops, and that adding means the same thing. Chutes and Ladders, Uncle Wiggly, Sorry, Parcheesi, etc. help addition skills. For children in lower primary and above, Monopoly and Scrabble both practice addition and multiplication, optimization of sums and mental math. Card Games: These games can be played using a standard deck of cards. Some are traditional card games, others are more mathy, but all can be fun. Having your child be the score keeper is an excellent way to practice mental math or standard algorithms. This is a game for three players. The goal is to be the first person to determine their own card’s value. This game is played with an ordinary deck with face cards removed. Aces have value 1; all other cards match their number. Play is as follows: one of three players is chosen as Dealer; Dealer hands out the cards evenly to two players who sit facing each other; each holds the stack of cards face down. Dealer says “Salute,” and the two players simultaneously take the top cards off their respective piles and hold them on their foreheads with the card facing OUT, so each player can only see opponent’s card. Dealer announces the sum of the two cards. First player to correctly announce his own card wins the hand, and keeps both cards. For short games, play continues until all cards have been played once; winner is player with most cards. Players then rotate who becomes Dealer and repeat until everyone has once played Dealer. For longer games, play continues in the style of War, repeating the game with cards won on previous rounds, until one player’s cards are exhausted. Players then rotate who becomes Dealer and repeat until everyone has once played Dealer. More advanced variations have the Dealer finding the product of the cards, or 3 times the sum, or …. For example, if the four cards are 3 of hearts, 8 of diamonds, 4 of clubs, 3 of clubs, then one possible answer is (3 + 3) × (8 - 4) = 24. Another is 3 × 8 × (4 – 3). Yet another is ∛8 ×4 ×3. A standard game of War is perfect for teaching young children to count and compare. The object is to win all of the cards. Suitable for 2 or more players. Dealer deals out the cards evenly between game participants. Number cards are worth their number; face cards are worth ten; aces 11. (Alternative rules: Aces represent one and face cards are ten.) Play proceeds as follows: each player turns over the top card from their own pile. Player with the largest value card wins all the cards. In the event of ties between highest valued cards, players who tied then shout “War!”, and count out three cards face down from their pile, and then display an additional fourth card. Winner takes all played cards. This is a game of Blackjack with all of the complicated rules removed. The object of the game is to get a hand of cards whose sum is as close to 21 as possible without going over. Suitable for any number of players. Number cards are worth their number; face cards are worth ten; aces are worth either 1 or 11, as determined by player’s choice for each ace they hold. Dealer deals two cards to each player. First player then chooses based on his hand whether to take another card (“a hit”) or to receive no more cards (“stand”). If he chooses another card, dealer lays it down face up for all players to see. Player then repeats this choice as often as he likes or until he goes over 21 (“bust”.) Dealer then moves on to next player and repeats the choice. (First player may not take more cards later in this round.) When all players have chosen to stand or gone bust, all players then lay down their cads so all players can see. Player whose cards are closest to 21 without going over is winner. Uno! is terrific for preschoolers through lower primary grades, teaching number recognition and matching. Most easily played by removing the face cards from a traditional deck, but local variations are numerous. Increase the difficulty by varying rules so the next playable card matches the same number or is the same color but only either 1 greater or 1 less than the current played card. Encourage score keeping by keeping track of the sum of losing players’ hands across many rounds; lowest sum after n rounds wins. Play Go Fish with a standard deck to help a preschooler or kindergartener practice counting and matching. To increase difficulty, keep score, counting the face value of all cards each player wins. Look for patterns in how to count things up more quickly. Variations of this game are numerous. Score keeping versions encourage the most practice with mental math and standard algorithms. Working with a deck of cards with face cards removed, player whose 2 2-digit sum is as close to 100 without going over wins the round. To begin, play an easier version until the concept is mastered: player whose sum is highest wins the round. Dealer deals out 5 cards face down to each player. On a turn, each player lays down 4 of 5 cards, face up, in 2 pairs, showing cards a 2 2-digit numbers. Example: Player receives 8 of hearts, 2 of spades, 3 hearts, 6 of clubs, 5 of spades. She plays 8h5s and 6c3h, because 85 + 63 = 148. She doesn't play the 2s, because using the 2 anywhere would have lowered her score. Player whose 2 2-digit numbers sum highest wins the round. Winner receives all cards. Dealer deals out 4 more cards to each player, repeating until deck is dealt. Player with most cards wins. Once this version is mastered, play this real version: player whose 2 2-digit sum is as close to 100 without going over wins the round.